Clarence Jordan is one of my heroes of the faith. 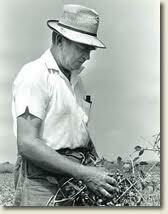 He was a leading Christian prophet in the southern United States during the twentieth-century. Born into a successful family in Talbotton, Georgia, Clarence studied agronomy at the University of Georgia before eventually earning a Ph.D. degree from Southern Baptist Theological Seminary in Greek and New Testament. Clarence was deeply committed to racial equality, and in 1942, he co-founded Koinonia Farm in Americus, Georgia, which followed the then-controversial conviction that all people, regardless of race, should be allowed to live together, work together, and eat together around a common table. Members pooled their resources in a common treasury, and they trained farmers – black and white – in advanced farming techniques to help break a cycle of poverty. Because of these commitments, Clarence and other Koinonians were disfellowshipped by their Baptist church, and Koinonia Farm was subjected to threats, violence, and economic boycotts. At one point, Clarence asked his brother and attorney, Robert, to serve as legal counsel for Koinonia. Robert refused, citing the damage it would do to his personal and professional aspirations. Eventually, Robert became a Georgia state Senator and Chief Justice of the Georgia Supreme Court. During their conversation, Clarence charged Robert with being an admirer of Jesus rather than a disciple. Their conversation is a gripping exchange that has challenged me to consider the ways in which I do or do not follow the challenging path of Jesus in my life. While reflecting on the tense exchange between Clarence and Robert Jordan, I have been gripped by another question: what became of their relationship? Did the brothers part ways because of their different understandings and convictions? Did they drift apart as Clarence lived at Koinonia and Robert achieved professional success? Did they continue their relationship and have further conversations in which both brothers were challenged and stretched? Did they grow closer to one another because of their mutual sharing and love? I have not been able to find a satisfactory answer to my question. One source suggests that Robert eventually came to be convinced by Clarence’s convictions. This source quotes Robert as saying that Clarence “was the greatest Christian I have ever known.” I find this possibility hopeful, but I have not located another confirmation. Perhaps this did happen. Perhaps the brothers who differed so vociferously over the most pressing social issue of their day did, in fact, remain in relationship with one another. I hope so. This entry was posted in Uncategorized on February 25, 2013 by Dean Allen. I recently enjoyed the day trying something I had never done before. I joined a group of youth from our church for a Snow Tubing adventure at Ski Hawksnest in Seven Devils, North Carolina. The day was cool and crisp with enough chilly wind to remind us it is winter but with blue skies spilling plentiful sunshine on the slopes. It was a fun day with lots of laughs and memories. 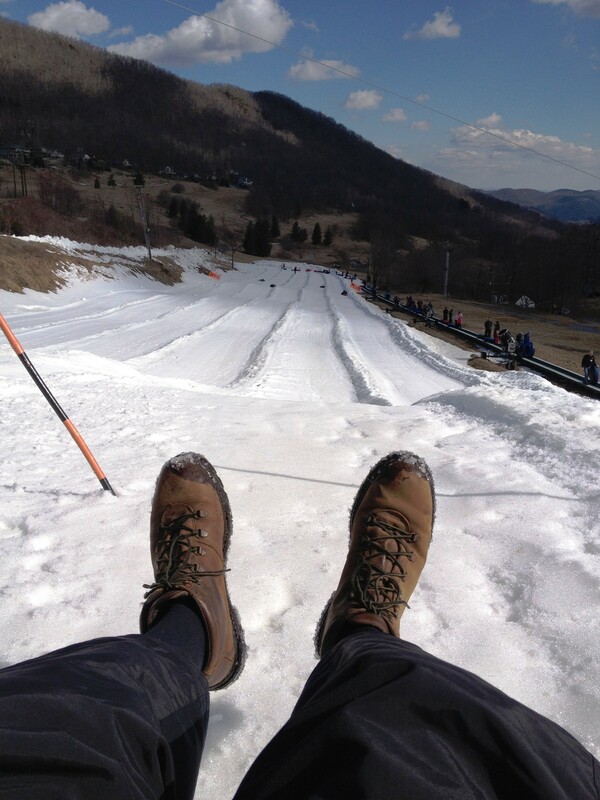 I have enjoyed sledding and snow skiing for years, but I had never been Snow Tubing before. To my surprise, the lanes are wide and gently sloping, the staff tells you when you need to slow down by digging your heels into the snow, and in case you are going too fast, large red bean bags are waiting to stop your skid! The best surprise, however, is that a conveyor belt carries you back up the hill. It is a fun time that I heartily recommend. This week, much of my time and attention will be given to preparing for worship on Sunday at our church. Throughout Lent, we are focusing on Luke, chapter 15, and the story of the Prodigal Son. On Sunday, my wife, Lisa, with whom I serve as Co-Pastor will try something we have never done. We will deliver a tandem dramatic sermon, and both of us will be in character portraying the hearers of Jesus’ parable. At the beginning of Luke, chapter 15, the text says that tax collectors and sinners – social and religious outsiders – listened to Jesus as well as Pharisees and scribes – religious authorities. During the sermon time in worship, Lisa and I will portray both types of hearers. We have never tried this before, and it will be an adventure! This entry was posted in Uncategorized on February 18, 2013 by Dean Allen. This week, we celebrate Valentine’s Day, and I have enjoyed seeing the candy, cards, and Cupids that emerged immediately after Christmas. This is a fun time when I am reminded to tell the people I love how much they mean to me and how thankful I am to have them in my life. Often Valentine’s Day is reserved for a special occasion between two lovers. Think of young lovers gazing into one another’s eyes while opening beautiful cards and expensive chocolates. I have learned good lessons, however, about Valentine’s Day from my second-grade daughter and from the Finnish. Like many elementary school students, my daughter is sharing Valentine’s greetings with all the students in her classroom. Every student is included, and no one is left out. Several days ago, she carefully wrote each student’s name to ensure proper delivery of the Valentine card. She made sure that every student will receive a Valentine greeting on February 14. My daughter even wrote her own name, ensuring that she will receive a Valentine greeting from herself! And, she prepared a special Valentine for an adult neighbor. She decorated a sheet of paper, wrote a special note on it, and just prior to sealing the envelope, she inserted a $20 bill. Sensing the enormity of this gift for an eight-year-old’s budget, I said that our neighbor would not expect to receive money. But, she insisted that she wanted to give the gift because of their friendship. She hopped on her bike, rode down the street, and gave her adult neighbor the Valentine. As expected, our telephone rang the next day, and our neighbor said that, while she appreciated the generosity, she did not think she should take money from a child. After thinking about it, my wife and I told her that the gift was given freely and generously, and we believed she should receive it and use it to buy something special. Extravagant generosity and deep-seated joy – all from an eight-year-old! In Finland, Valentine’s Day is called Ystävänpäivä, which means “Friends Day.” On this day, Finnish people are encouraged to celebrate all their friends, rather than simply their lovers, and exchange greetings with a wide number of people. This is a good reminder that many people enrich our lives, and we can express our appreciation to them at this special time of year. On Valentine’s Day this year, or perhaps during the coming weeks, you can take time to express gratitude to a number of friends. A card, a handwritten note, or a telephone call would be much appreciated – and it would make your own day brighter! This entry was posted in Uncategorized on February 13, 2013 by Dean Allen. Baptist Women in Ministry (BWIM) is an organization that encourages churches to support the giftedness of women for ministry and to encourage women to use their gifts in all aspects of the church’s life. Since 2007, BWIM has invited Baptist churches to participate in Martha Stearns Marshall Month of Preaching by having a woman preach during the month of February. This annual event has been a deeply significant source of joy and discovery for many women and churches. This Sunday, Amanda Miller will be our preacher. Amanda has been a very important member of our congregation since she moved to Spartanburg. I am grateful that she will be our preacher, and I pray that she will continue to experience God’s blessings and live her call to ministry. This entry was posted in Uncategorized on February 5, 2013 by Dean Allen. On Wednesday, February 13, our church will begin its observance of Lent with an Ash Wednesday service. We will share supper in the Dining Room and then gather in the sanctuary for worship, joining our sisters and brothers from around the world in having ashes placed on our foreheads as a symbol of our penitence. The ashes are mixed with oil, and this mixture reminds us of important truths of our life and faith. Life is a mixture of joy and pain, sorrow and hope. The ashes are a sign of pain and sorrow, which comes when we remember both our sinfulness and Christ’s self-giving love. The oil is a sign of renewal and hope. So, when have ashes placed on our foreheads, we carry with us both the ashes of regret and the oil of renewal. During the first five Sundays of Lent, we will use Luke 15 as our focal Scripture. This chapter contains some of the most beloved of Jesus’ parables. We will consider the audience for Jesus’ parables, which was composed of religious outsiders (tax collectors and sinners who came to hear Jesus) and insiders (Pharisees and scribes who grumbled). We will encounter three parables of lost things, and then we will take time to focus on the different characters in the Parable of the Prodigal Son, the Lost Brother, and the Loving Father. 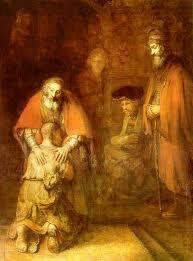 As part of your Lenten practices, you are invited to read a book by Henri Nouwen, The Return of the Prodigal Son, which he wrote after viewing the painting of the same name by Rembrandt. We will read and reflect on chapters of this book during the weeks of Lent, and you are invited to join this communal practice. I look forward to sharing with you these important worship experiences, and I am grateful to walk with you on the journey of our lives. This entry was posted in Uncategorized on February 4, 2013 by Dean Allen.